The mission of Tanner Industries, Inc. is to constantly improve our products and services to meet or exceed our customers needs, to distribute our products in a safe, efficient and environmentally responsible manner, and to generate a reasonable return in order to provide continuity for the business and employment for our employees. Responsible Distribution is a comprehensive quality program dedicated to protecting the health and safety of employees, communities, and the environment. Our Responsible Distribution program is third party certified. We have successfully completed a documentation verification assessment of RD conducted by Underwriters Laboratories, Inc. in 1995. We have also successfully completed on-site management systems verifications conducted by Science Applications International Corporation (SAIC) conducted in December 1999 and Parker and Associates in September 2003. Eagle Group has conducted the last two onsite audit verifications, March 2007, May 2010 and most recently January 2015. All audits were successfully completed. We have maintained our certification as a condition of membership in NACD. We have a Quality Manual which contains our company Mission Statement as well as applicable quality process procedures not addressed in our RD manual. This manual along with our Plant Standard Operating Procedures would contain the documentation of our in-house quality control processes and are available for review. Tanner Industries, Inc. is a distributor of anhydrous ammonia. The material is transported to our facility by rail car or tank truck and then transferred from this equipment to either our on-site storage vessels or transport cargo tanks. From the storage vessels the material can be repackaged for bulk or non-bulk distribution to end-users. Our suppliers are evaluated on product quality, price, and their ability to service our requirements. Aqua ammonia is a water solution of ammonia, and assay is determined by weight of ammonia in water. We produce this material in a batch process. Each batch is tested for strength, color, and clarity. Trace element analysis is performed every 6 months by an independent lab, and are available for review. For Technical Grade material the trace element specifications will vary depending on the public water supply for each facility. Therefore each facility has its own published trace element specifications. Reagent Grade material is made using de-ionized water and meets the American Chemical Society (ACS) for Reagent Grade Aqua Ammonia specification, regardless of which facility it is produced at. We have the ability to customize strengths to meet our customers’ needs. Listed below is our stock production ranges. The owners, management and employees of Tanner Industries, Inc. are committed to the prevention of accidental releases of ammonia. 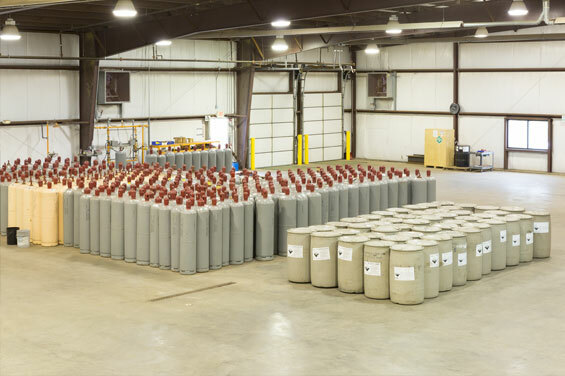 Our company has implemented the standards of the US Occupational Safety and Health Administration (OSHA), 29 CFR 1910.111, "Storage and Handling of Anhydrous Ammonia" as well as the published provisions of the CGA 2.1 2014 6th Edition, "Safety Requirements for the Storage and Handling of Anhydrous Ammonia". We have a Risk Management Plan in accordance with the Environmental Protection Agency's (EPA) Risk Management Program under the Clean Air Act, and implement OSHA's Process Safety Management Standard, 29 CFR 1910.119. Our commitment to the Responsible Distribution Process (RDP) provides our company with an integrated health and safety, environmental, and product stewardship program that is supported by our strong corporate capabilities. Our dedication to the proper distribution and stewardship of ammonia includes involvement in emergency response training for first responders and other industry personnel to enhance the protection of our employees and community neighbors.